How is Satya Wacana responding to its environment? 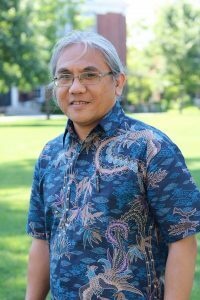 “As a university,” he said “Satya Wacana decided to improve its performance in research.” That’s because the Indonesian government is challenging universities to improve their research capabilities, including applied research that can help Indonesian society. Satya Wacana has strong research programs in molecular biology, small and medium enterprise dynamics, and gender studies, for example, but wants to enhance these and add research capabilities in more disciplines. To make that happen, Satya Wacana’s rector has set a goal of having 150 to 170 PhD faculty by 2017. “We are lucky as a university to have international partners for collaboration,” Dr. Rupidara said. “We have sent staff there to do MAs and PhDs. Now we have to do more.” He hopes Satya Wacana can find more opportunities to research collaboration among universities in the United Board network. “Can the United Board open a door for us?” he asked. “It has done this through leadership and fellowship programs. Can we do the same with research?” Collaborative research in service-learning, for instance, could bring benefits to multiple colleges and universities. The SPRD Workshop sessions explored ways for colleges and universities to set goals, build support among stakeholders, raise funds, and communicate success. Often these institutions, like Satya Wacana, must compete with large public universities. “We are a smaller university,” Dr. Rupidara said, “but don’t underestimate us!” Through the United Board’s network, these strategic planners can find ways to make their institutions more effective in teaching, learning, and sharing knowledge with their communities. Neil Rupidara earned his PhD from Macquairie University with partial support from the United Board Faculty Scholarship Program. He was a 2002-2004 United Board Fellow.